I’ve been a fan of Jeff Soto’s artwork since the early 2000s, and I’ve always wanted to work with him on a project. When The Volcom Garden opened in Austin, it seemed like the perfect opportunity to reach out, invite him to Texas and showcase some of his art (God willing). 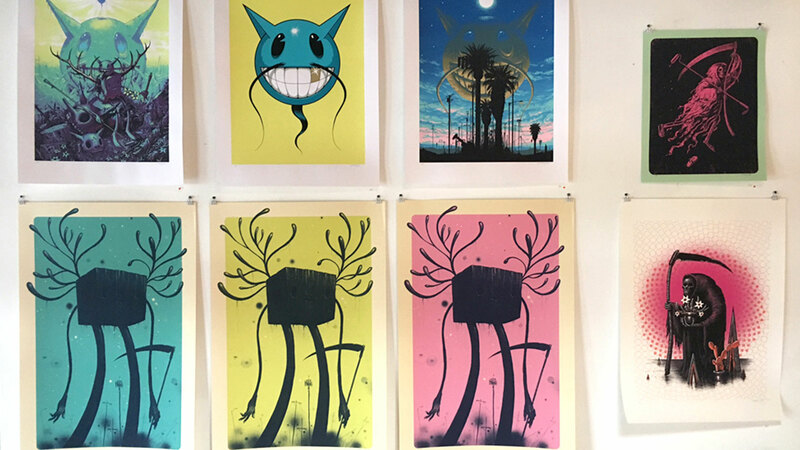 I knew that Jeff had designed screenprints for most of his professional career, so I pitched the idea of a print show, and, to my surprise, he was totally receptive to the idea. 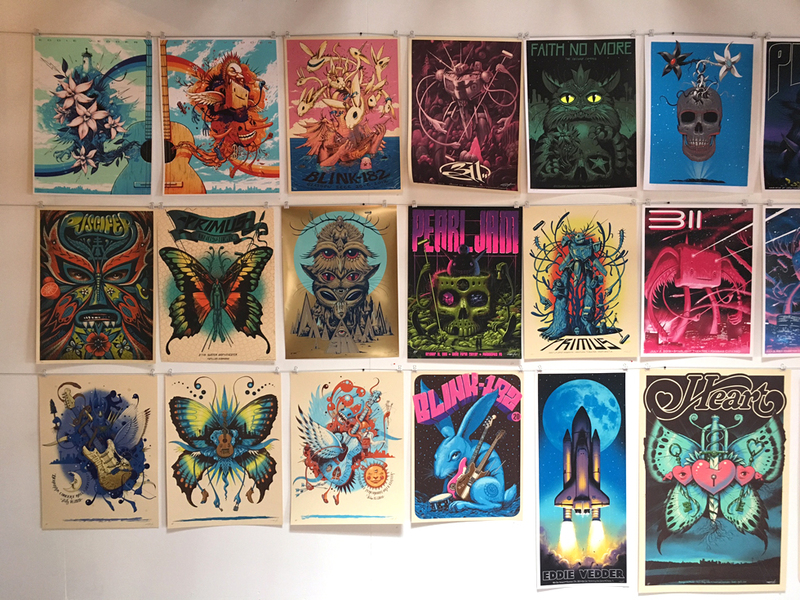 What initially started as a best-of concept turned into a comprehensive retrospective of every print Jeff has designed over the past 15 years, since 2002 when he graduated from art school. Not only was this Jeff’s first major exhibition in Texas, but it was the first time all of his prints had been shown in their entirety. For a curator, this is dream territory. Check out the exclusive Volcom Garden collection, only available at The Volcom Garden an online at volcom.com! 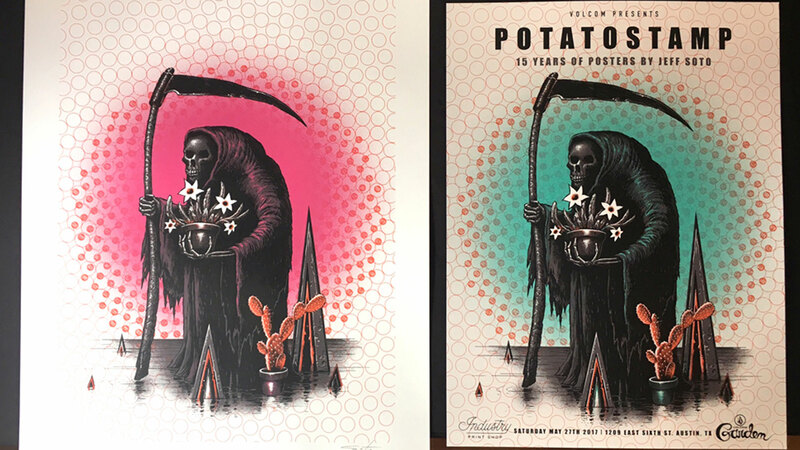 WE TEAMED UP WITH INDUSTRY PRINT SHOP IN AUSTIN TO PRODUCE TWO NEW PRINTS SPECIFICALLY FOR THE EVENT: A LIMITED-EDITION SIGNED/NUMBERED FINE-ART PRINT, AND A LIMITED-EDITION GIG POSTER FOR THE GALLERY ITSELF. BOTH ARE AVAILABLE THROUGH THE GARDEN. HIT US UP @VOLCOMSTUDIO ON INSTAGRAM. WE’LL SORT YOU OUT! This is a photo of Jeff signing the fine-art print to prove to you that he’s not actually an art robot sent from the future. I assure you, he’s a real man of flesh and blood. I even heard him pee. He’s legit. During the opening we also printed some hecka limited-edition Soto/Volcom/Garden split-fountain tees. Don’t even bother looking for these on eBay. They gone, man. I’d like to thank Jeff for coming out to Texas and sharing his print collection with us. I’d also like to thank everybody that came out to celebrate this amazing body of work with us. 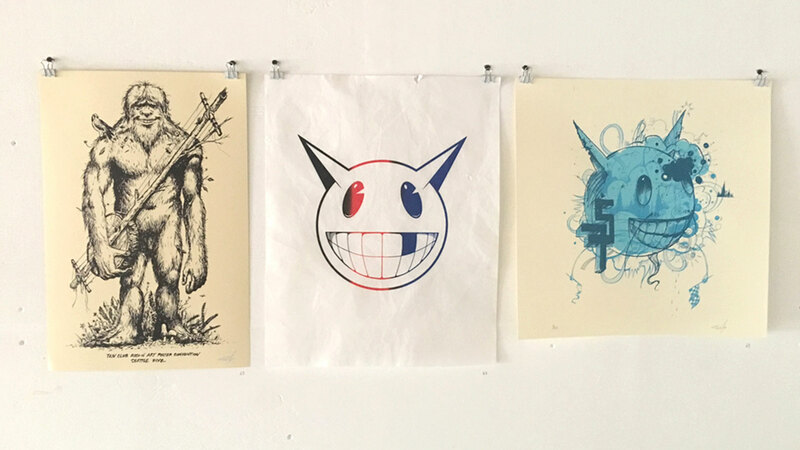 The show will remain up until the 18th of June, so swing by if you can make it to Austin in time. If not, there’s always the next show. We ain’t going nowhere! See more of Jeff’s work at jeffsoto.com and follow him on Instagram @JeffSotoArt! Keep up with happenings at The Volcom Garden on Instagram @VolcomStudio. The Volcom Garden is located at 1209 East 6th Street in Austin, Texas. Store hours are Monday – Friday, 10am – 8pm.